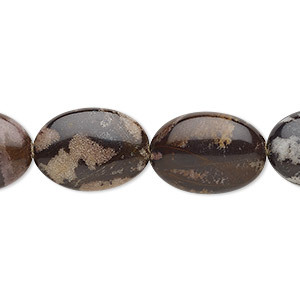 Bead, brown fossil coral (natural), 18x13mm flat oval, B grade, Mohs hardness 6-1/2 to 7. Sold per 15-1/2" to 16" strand. Item Number: H20-9583GS Have a question about this item? Lovely patterns of prehistoric coral formed during the Devonian period, roughly 350 million years ago. 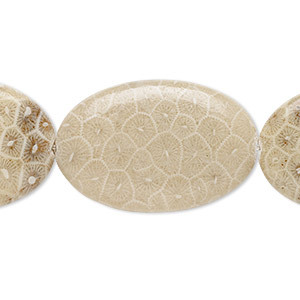 Light and dark sandy colors of the ocean floor with exquisite lace-like natural designs. Primarily composed of calcite with quartz inclusions. 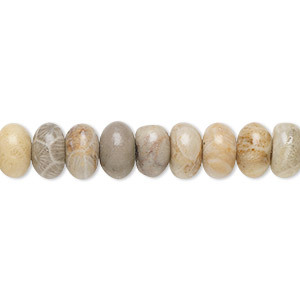 Bead, outback jasper (natural), 18x13mm puffed oval with 0.5-1.5mm hole, B grade, Mohs hardness 6-1/2 to 7. Sold per 8-inch strand, approximately 10 beads. 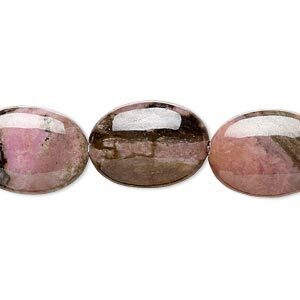 Bead, rhodonite (natural), 18x13mm puffed oval, B grade, Mohs hardness 5-1/2 to 6-1/2. Sold per 15" to 16" strand. 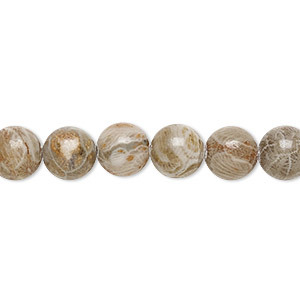 Bead, brown fossil coral (natural), 6mm round, B grade, Mohs hardness 6-1/2 to 7. Sold per 15-1/2" to 16" strand. 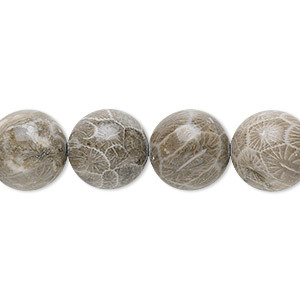 Bead, fossil coral (natural), 8mm round, B grade, Mohs hardness 6-1/2 to 7. Sold per 15-1/2" to 16" strand. 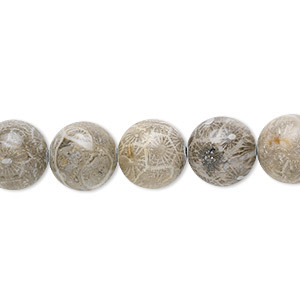 Bead, fossil coral (natural), 10mm round, Mohs hardness 6-1/2 to 7. Sold per 15-1/2" to 16" strand. 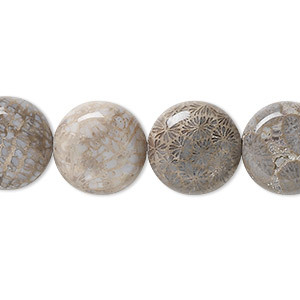 Bead, fossil coral (natural), 14mm flat round, B grade, Mohs hardness 6-1/2 to 7. Sold per 15-1/2" to 16" strand. 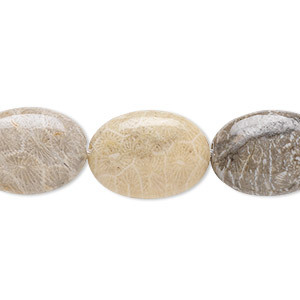 Bead, fossil coral (natural), 30x20mm oval, B grade, Mohs hardness 6-1/2 to 7. Sold per 15-1/2" to 16" strand. 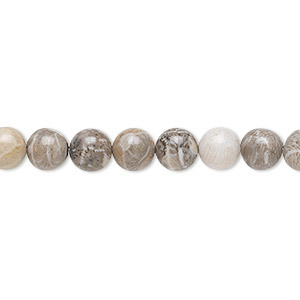 Bead, fossil coral (natural), 8x5mm rondelle, B grade, Mohs hardness 6-1/2 to 7. Sold per 15-1/2" to 16" strand. 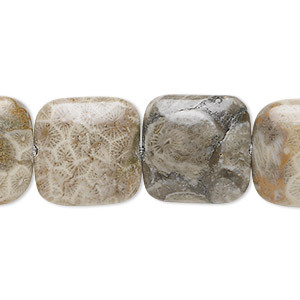 Bead, brown fossil coral (natural), 12mm round, B grade, Mohs hardness 6-1/2 to 7. Sold per 15-1/2" to 16" strand. Bead, fossil coral (natural), 16x16mm square, B grade, Mohs hardness 6-1/2 to 7. Sold per 15-1/2" to 16" strand.